Name A Star Live’s Virtual Planetarium™ software includes a library of stunning astronomy imagery; information about the sky, the solar system and the latest space events; and space weather reports about sun spots, auroras and more. With an Internet connection hundreds of images can be updated with live satellite data at the click of a button. The software was developed by Rice University and the Houston Museum of Natural Science, and has received a favorable review on the “Top Ten Reviews” website. Below are some screen shots that will give you a sense of what the software will look like on your computer. 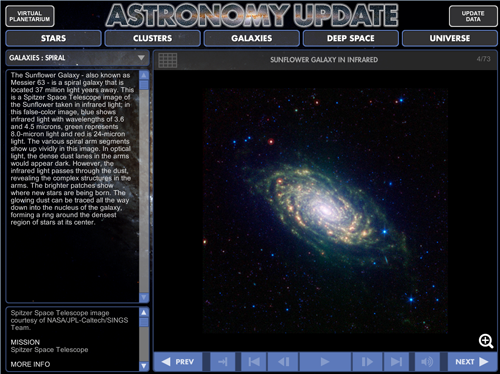 Virtual Planetarium’s “Astronomy Update” features beautiful photos of stars, galaxies, and other deep space objects. You can learn all about the wonders of the universe with the detailed information that accompanies each photo. Closer to home are the planets of our solar system. 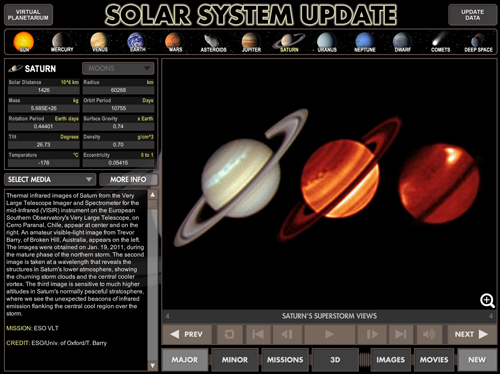 Virtual Planetarium shows you all sorts of info about the planets, their moons, and the latest discoveries by space missions, such as the Mars Curiosity Rover. You can watch awesome movies about our solar neighborhood. A click of the “UPDATE DATA” button downloads the latest NASA discoveries to your computer. And check out the 3-D images using the 3-D glasses we send you with the software! The “Sky Tonight” module shows you exactly where to look to see the major stars, planets and constellations visible from your home on any night of the year. 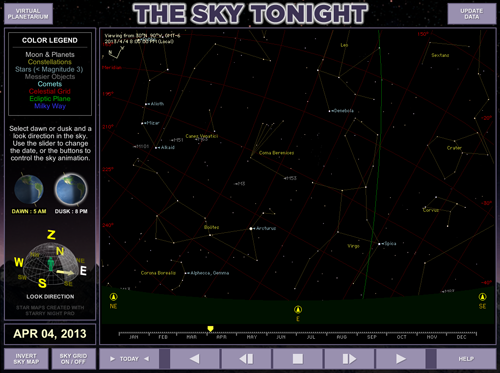 Toward the lower, left corner of the screen, click on “N,” “S,” “E,” or “W” to see what the night sky will look like when you face North, South, East or West, respectively. Click “Z” to see what the sky will look like overhead (at what’s called the “Zenith”). Since the stars move across the sky over the course of any given night, you can choose to see what the sky looks like at either 5 a.m. or 8 p.m. local time. And you can change the date of the display to any date of the year. While the software will not show the star you named, you can use it in combination with your Name A Star Live Star Chart to find the position of your star in the night sky. Believe it or not, there is such a thing as “space weather”! Basically it refers to the effects of solar radiation and storms on the planets, spacecraft and Earth. For example, a solar storm in 1989 caused the Hydro-Quebec (Canada) power grid to go down for over nine hours! On the other hand, the beautiful “Northern Lights” are also caused by space weather. 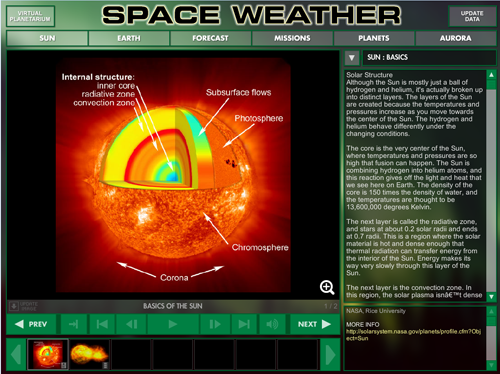 Virtual Planetarium’s Space Weather module explains this fascinating information and keeps you up to date with the latest space weather forecasts! 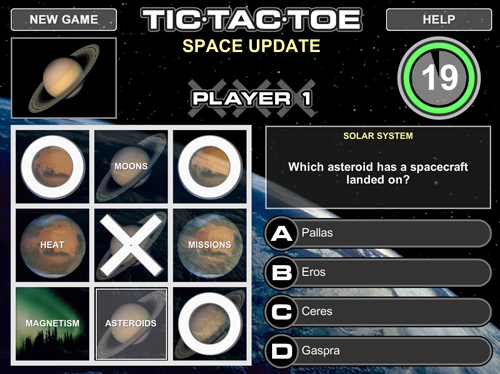 The Tic Tac Toe module provides a fun way to learn about space and astronomy — for all ages! Virtual Planetarium is included in our Deluxe, Framed and Ultimate Gift Sets. It’s also included in our Instant Gift Set Premium with Virtual Planetarium gift set.